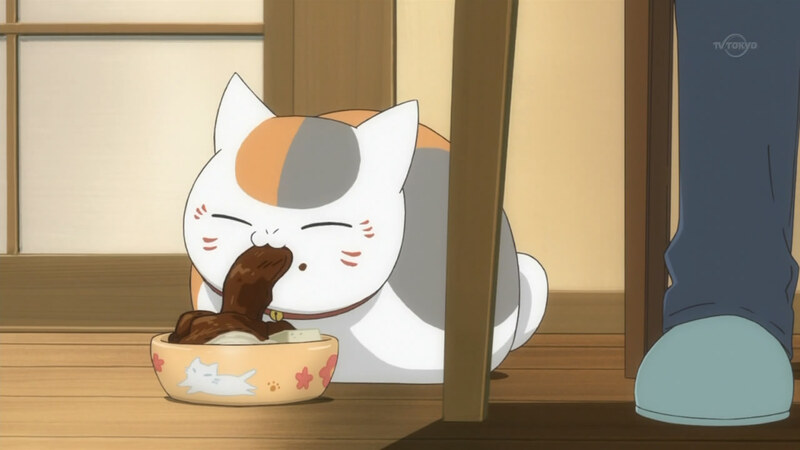 Natsume! 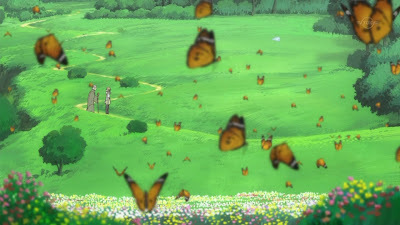 Natsume, Natsume, Natsume~ If it's not clear yet, I love this anime. I loved the last two incarnations of it and, fully biased, I'm most likely going to love this third season as well. 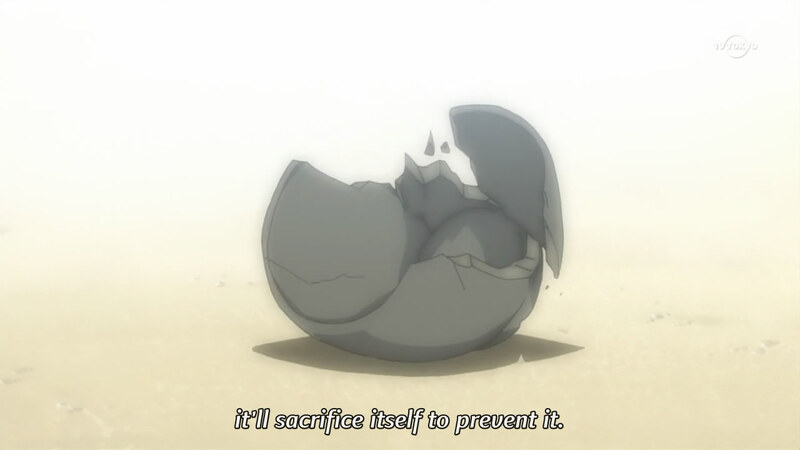 I couldn't wait to watch this episode and, at the same time, I needed to prepare my heart for it. It's an anime I love that fills me with sadness. 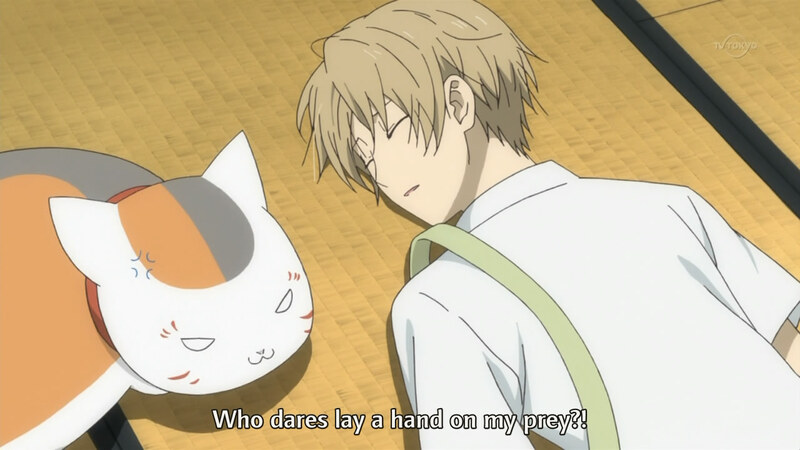 Oh, Natsume, I didn't even know I missed you, but I did. I won't lie; because of how long it's been, I barely remember any of the characters or any of the major stories that occurred in the anime so far. 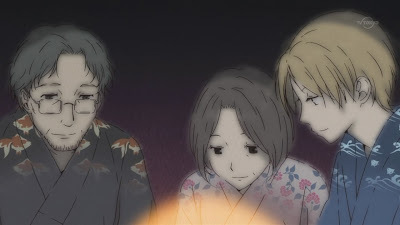 Because of that, I'm really glad that the first episode did a little "recap" of sorts, reminding the viewers about the Book of Friends (yuujinchou) and Natsume Takeshi's grandmother, Natsume Reiko. Other than the recap, this hardly felt like a first episode, enshrining the typical handful of demons that each episode tends to have and the returning of names (along with some flashbacks about Reiko, but hardly anything revealing). Nonetheless, I loved every moment of it. The episode began with two demons (appearing later in the episode, too) walking through the forest and a much larger (and more menacing) demon stopping them to ask about the whereabouts of a human boy. After leaving due to their lack of information, said human boy - Natsume! - dropped down from the tree, startling the two demons, and then ran away. 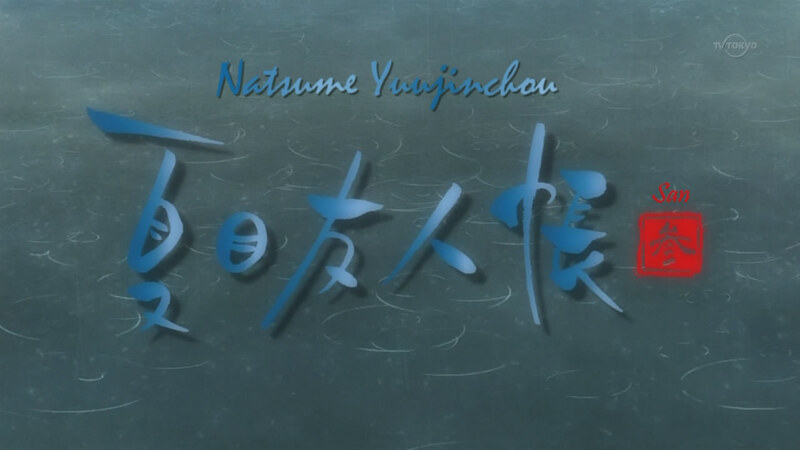 After the episode title, Natsume finally got back to his house, only to find a little teacup with legs and one eye running around in the front yard. Despite it all, he's so protective of his charge. The major story of the episode began as Natsume was walking home from school that day, and stopped to help an old woman who had fallen and couldn't find her walking stick due to bad eyesight. 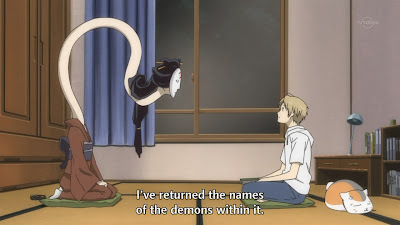 It turned out that she was a demon, and realized Natsume's incredible spiritual power upon touching him. She demanded a request from him; she wanted to find a fearsome demon that she had once borrowed a mirror from and wanted to return the item to. 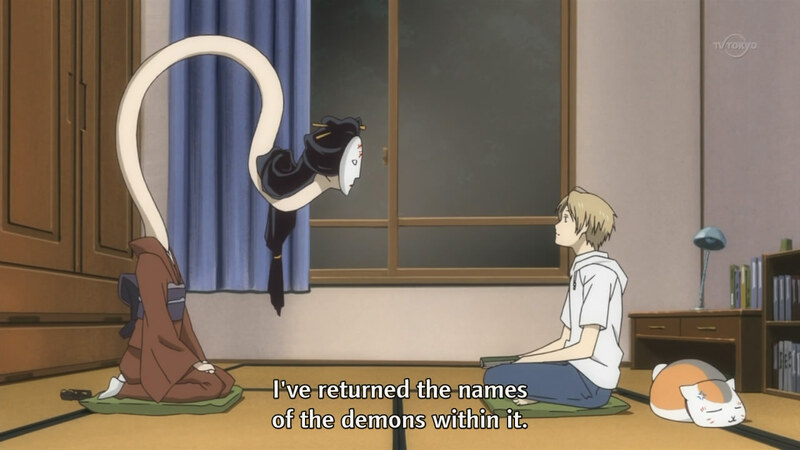 Natsume ran away, scared and not wanting anything to have to do with demons (since he didn't want to bring problems to his adoptive "parents"), but the woman showed up outside his bedroom window that night and got him to agree to help. After a dream about the old woman befriending a tree, the next day began with Nyanko-sensei explaining that the old woman was the type of demon that have been enshrined and worshipped, so any weaker human or demon would be cursed upon touching them (although both Natsume and Nyanko-sensei were fine). After meeting up with the woman and heading into a meadow, she explained about the spirit that she had met a long, long time ago - and, with each passing sentence, it became clear that it was Reiko in her school days. I'm definitely above crying. Absolutely. 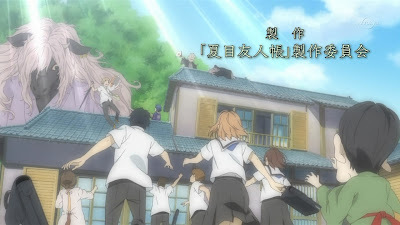 As if to remind us of the dynamic, the demon from the beginning showed up in order to take the Book of Friends by force and grabbed Natsume, biting his shoulder. Nyanko-sensei transformed to his full form to defeat him, after which Natsume returned to the old woman her name, also explaining that the "spirit" she had met in the past was actually a human and his grandmother. 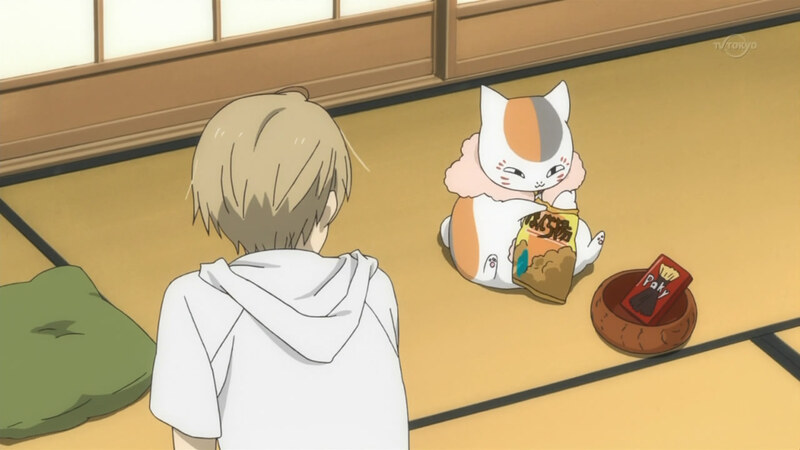 After returning home, Natsume found Touko outside in the front yard, commenting that an unknown shattered teacup was on the ground. Remembering the cat's words, it was obvious that the teacup demon had sacrificed itself to ward away the impending disaster (Natsume being gravely injured by the demon). It's hard to feel alone with this much happening. This episode brought back all of my previous feelings about this anime in full force, aided especially by the series of quick flashbacks regarding Reiko and the old woman. Despite the slice-of-life feel and the fact that nothing major really happens, the underlying foundation of this story is full of sadness, dealing with concepts of being alone and forgotten (for both humans and demons). 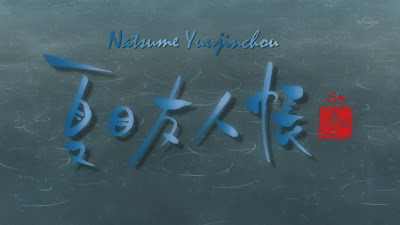 I've always felt as though this story is essentially trying to supplant a layer of hope and happiness (the present, with Natsume) on top of the foundation of loneliness and yearning (the past, with Reiko). That's why, despite how much I like it and how happy I am to watch this third season, I'm also filled with a lingering sadness. Just as I had expected, this third season is just like the previous two seasons of Natsume Yuujinchou. I'm incredibly overjoyed to have an anime this season that I like so much to begin with and, at the risk of somehow jinxing it, I'm sure that it won't let me down. Obviously I'm biased, but I can't help it. My inner fangirl is just so incredibly giddy and excited.